We believe in the KISS model – Keep It Simple Stupid. All of our repairs have a base rate of $49 plus parts (if any is needed). Sometimes, the repairs are so extensive that $49 doesn’t cover our costs. If that’s the case, then we’ll talk to you before making any repairs. 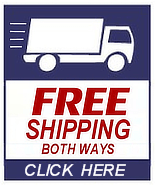 Shipping is FREE both ways, in and out for the entire United States including Alaska, Hawaii, Puerto Rico, Guam, or the U.S. Virgin Islands, and APO. International clients may send their headphones using the carrier of their choice. Please download, fill and include this form. Our return shipping is free. We will email you an invoice to pay online after your headphones are repaired. We really hate to do it, but if we don’t receive payment within 30 days after invoicing you we will keep your headphones as payment for work performed. If we can’t fix the headphones (or we can’t find the problem), then you don’t pay anything! If you want a more accurate estimate, just contact us and we’ll go over what repairs need to be performed. You obviously want to know that you are receiving good value for your money. So each repair comes with a 90 day warranty on our repairs included in the cost.